Cloudland Canyon is one of the most beautiful places I have ever been camping. It is quiet and filled with the gentle sound of trickling water. It is known for its waterfalls, but the small waterfalls are just as beautiful as the bigger more famous waterfalls. The park is situated on the Southeast corner of Lookout Mountain, but isn't overrun with tourists like the Northeast side of the park. A deep gorge runs through the park, which is filled with creeks, waterfalls, and lush vegetation. On a quiet evening, camping in this park, the children can explore and discover adventure while the adults find peace around a fire. During the day, extensive hiking trails innervate the park offering views of rare beauty. At night, after the campfire is out and all the campers have retired to their tents to sleep, it is said that a ghost wanders the park leaving footprints behind him. The ghost is often seen on a high point in the park looking down on visitors. He is seen on horseback and in the garb of a Cherokee brave. Many campers report seeing him at their campsite and other campers have reported finding the tracks of an unshod horse in their campsite when they wake up in the morning. He is often seen wandering between campsites, watching the campers. These sightings are not described as fearful encounters and many believe the Native American is there to protect the park and its residents. 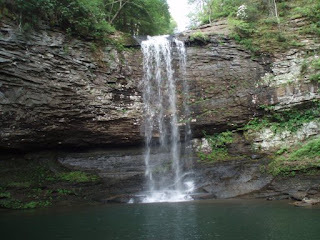 I never saw this ghost while we were camping in Cloudland Canyon, but I could see why he would want to stay in the park, even after death. It is one of the most beautiful places I have ever camped. What a beautiful place! I can see why you like camping there. It is so green and comes with its own ghost... perfect. Thanks for sharing. Sorry I have been out of touch for so long. Promise to be better! Beautiful! I haven't camped in sometime. I wouldn't want to leave such an enchanted place. 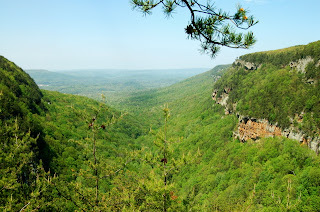 I wanted to see Cloudland Canyon for sometime, but for the scenery and the birds. I'm glad to know there's a legend as well! Great pics!